Adam spent his early years growing up on Bowen Island, eventually relocating with his family to North Vancouver. He attended Sutherland Secondary, where he excelled, both academically and in sports. He was the captain of the basketball team and was named Athlete of the Year for his two senior years. His leadership skills were evident even then. Adam was honoured to speak to the over 1200 students of the graduating classes of VCC and CDI in the fall of 2015 and was the keynote speaker at BCIT’s 2016 Alumni AGM. He is also thrilled to be a winner of BC Business 2016 30 Under 30! 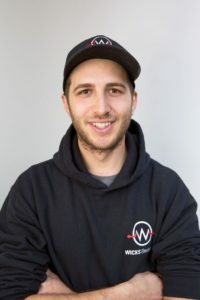 Adam began his electrical apprenticeship in 2007 with the one goal in mind: to acquire and master the necessary skills to start his own business. Building a reputation for a business that provides outstanding workmanship and customer service while providing people with a job they love has always been the source of Adam’s excitement and inspiration. He has established a team of first class electricians, ones who share his passion for the trade and who portray the same positive energy. Adam believes building long lasting and trusting relationships with all his clients will be the key to his success. 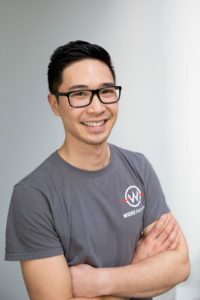 In what little spare time he has, Adam enjoys playing in the men’s basketball league that he sponsors, hitting the gym, hiking, snowboarding, travelling and reading. Quinn was born and raised on the North Shore and also attended Sutherland Secondary. He was working as an apprentice for another electrical company when he ran into Adam at the gym one day. Recognizing the Wicks Electric name on Adam’s shirt from high school, they struck up a conversation. 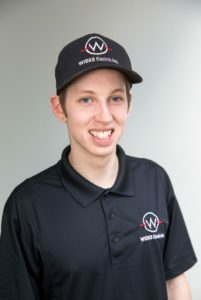 Adam was impressed with Quinn right off the bat and soon convinced him to join Wick’s Electric where has quickly risen through the ranks to become an important member of them team, successfully managing job sites and projects. In December 2017 Quinn completed his apprenticeship and is now a Red Seal Journeyman Electrician. Adam says that Quinn is an all-star in everyone’s books and is an invaluable member of the team. Quinn is a huge sports fan, (Go Canucks Go!) and enjoys playing hockey, soccer and working out. He enjoys being on and around the water and loves to fish. Bill was born and raised in Vancouver and completed his Red Seal ticket at BCIT. At one point he and Adam were classmates. They share a similar dedication to the trade and Bill joined Wicks in April 2017, bringing over 12 years of varied experience to the team. Bill is dedicated to perfection in his work. Bill and his wife Tracy welcomed their son Emmitt to the world in the spring of 2018! The first baby for the team here at Wicks! Bill has little spare time these days but enjoys racquet sports and has traveled to Hawaii, China and throughout the western States. Ryan grew up in Adelaide, South Australia – home of the mighty Adelaide Crows. In 2010 Ryan moved to Canada and began his electrical apprenticeship. His passion for the trade and commitment to always learning and perfecting his skills earned him his red seal certification in 2017. 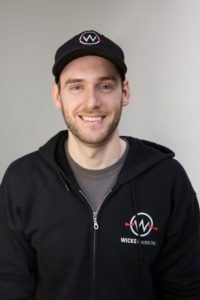 Ryan sought out to work for Wicks Electric because he admired the company culture, comradery and dynamic electrical projects always in the works. When Ryan is not managing a work-site he is likely watching or playing sports. He currently plays for the Vancouver Cougars and is on a softball team. Fun fact about Ryan: he is very eco-conscious and is always looking to incorporate renewable clean energy sources. Marlon grew up in Kenora, Ontario where his father owns and operates an electrical contracting company. At a young age Marlon took interest in the trade and decided to follow in his father’s footsteps. He completed his apprenticeship schooling at Algonquin College in Ontario and became a red seal certified electrician in 2015. Marlon is a skilled electrician with experience in both residential and commercial construction. 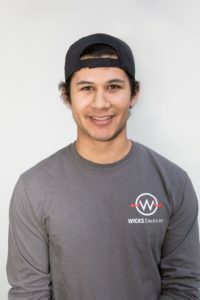 He has been part of the Wicks crew since February of 2018, and quickly proved himself to be a great asset to the team. In his free time Marlon enjoys staying active by biking, hiking paying volleyball and exploring BC. Chris was born and raised in Kamloops, British Columbia. 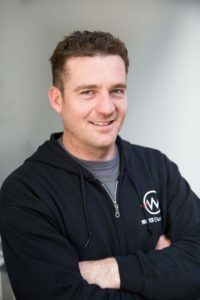 He completed his Red Seal certification in 2011 at Thompson Rivers university and went on to acquire his FSR-B through Ace Trades Institute of Technology. Chris is a well-versed electrician having worked on residential, commercial and industrial projects. Chris was attracted to the electrical trade because of its diversity and being able to develop so many specialty skills. He likes the thrill of being able to solve a problem and to work with new clients everyday. 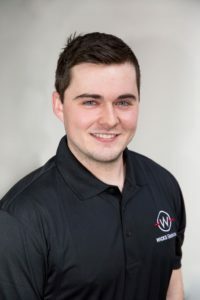 Chris got started with Wicks in the Fall of 2017 and is currently our lead service technician. When Chris isn’t in work mode he is out and about around Vancouver exploring the mountains, restaurants and coffee shops. Fun fact about Chris: He loves to travel and so far he has visited 30 countries. One of our newest crew members Ely, was born and raised in Coquitlam. He became a journeyman electrician in 2016 after completing his schooling at BCIT. Ely was attracted to the electrical trade because he has always enjoyed working with his hands and diagnosing and fixing problems. Looking for a company where he could put his skills to the test Ely applied to Wicks. When Ely is off the clock he loves to hit the slopes on his board or play a game of pick-up soccer with his friends. Dustin met Adam through a mutual friend and would run into Adam at the gym and they would strike up a conversation. He was just starting his apprenticeship at that time over three years ago. 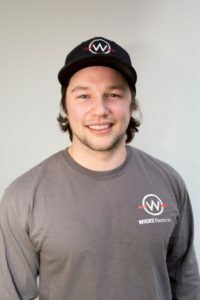 As Wicks Electric grew and Adam was looking to hire an experienced 3rd year apprentice he immediately reached out to Dustin and asked him to join the team. Along with experience he contributes his enthusiastic energy to the team. Dustin is an avid hockey player and has played the sport for over fifteen years, 11 years in a minor league and 4 years in junior hockey in the Lower Mainland, Kootenays and Alberta and loved every minute of it! He also coaches peewee hockey at the North Shore Winter Club. In his spare time he enjoys working out and long walks on the beaches. Turner was born and raised in North Vancouver and is also yet another member of the Sutherland Secondary alumni. He played most of the sports available to him at Sutherland including; basketball, soccer, rugby, golf and badminton. However he was also playing baseball, football and lacrosse outside of school. He remembers seeing many of his new co-workers in the hallways like it was yesterday. And since recently joining the Wick’s crew, he is able to see those beautiful faces everyday once again. Turner started his electrical training straight after high school and has continued on and off for the past 7 years. He has a wide range of electrical experience, from industrial metal fabrication plants to commercial retail stores and constant home renovations. Turner is a student at BCIT and is in the process of completing his Red Seal electrical certification. When he’s not playing soccer in the winter or softball in the summer, he likes to spend his free time traveling with friends, hitting the gym, hiking with his dog or trying to guess next weeks lottery numbers. Ty grew up just outside of Vancouver in the town of Tsawwassen, but moved into the city shortly after high school in an attempt to be closer to the mountains, beaches, and cheap sushi. Ty is currently in his first year of his electrical apprenticeship after completing the Trades Discovery course at BCIT. Ty was drawn to the electrical trade because everything happens so seamlessly that it feels like complete magic that at the push of a button you can have light, warmth and entertainment instantly – he takes pride knowing he can bring some of that magic into the world every day. 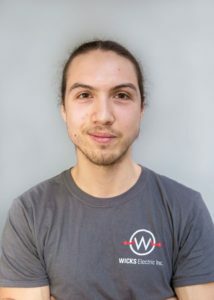 Ty has been with Wicks since his practicum at BCIT. In his free time he enjoys hiking, climbing, skiing, and playing as many musical instruments as he can get his hands on. Jake was born in Sunderland, England but moved to beautiful British Columbia at a young age. He attended Sutherland Secondary for high school, where he became friends with Adam Wicks on and off the basketball court. Jake recently completed his first year of electrical training at BCIT and was recognized as the Klein Tools “outstanding graduate” for his hard-work and dedication to the program. Jake began his apprenticeship with Wicks knowing Adam would support and encourage him as an apprentice and give him the knowledge and skills he needs to be successful as an electrician. Off the job-site Jake loves to play indoor/outdoor soccer and basketball and spend his time on the mountains. Fun fact about Jake: He used to be in the BC boys choir when he was younger and got to sing the national anthem at a Canucks game with his brother. 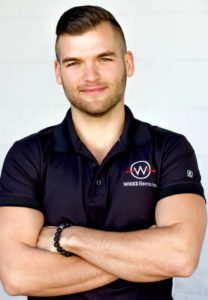 Born and raised in Port Coquitlam, Mike is the youngest electrician on the Wicks crew. He is a diligent and dedicated worker. Mike has completed three years at BCIT and is currently a fourth year apprentice studying for his IP to become a Journeyman. 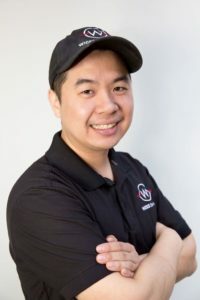 He is passionate about the trade because he loves the challenge of troubleshooting something and then being able to diagnose the problem and learn from it. Mike has a wide range of experience including residential, commercial and industrial. 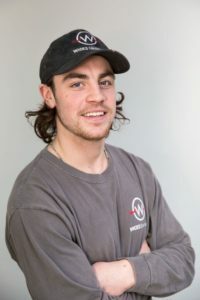 Mike joined the Wicks Electric while he was completing his most recent apprenticeship and immediately became part of the family. When Mike isn’t hard at work on-site or studying you will find him adventuring in the surrounding mountains or playing his favourite sport, road hockey. Jasmine grew up in Montreal, Quebec. She can’t quite remember when she set out on her first business endeavor – but whenever it was it was early and it was gratifying. So when it came time to choose a program, a business degree with a major in entrepreneurship seemed like the obvious way to go. Upon graduation Jasmine set out on her next big adventure and moved to the west coast of Canada. 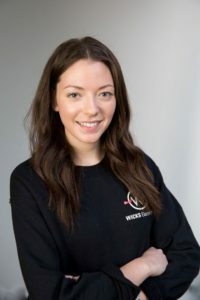 Looking for a new business challenge and an environment where she could put her skills and experience to the test she got connected with Wicks Electric. Jasmine helps out behind the scenes with scheduling, invoicing and marketing for the company. When Jas isn’t in the office she is out discovering more of BC’s beautiful scenery and mountains. Cathy (Momma Goose) helps out on the administrative side of the business. After 35 years in nursing she retired from the profession and she and Terry moved to the Cowichan Valley on Vancouver Island. Cathy and Terry celebrated their 34th anniversary August 2016! Cathy brings her sense of entrepreneurship to the company as she ran her own successful home health business with over 100 employees for a number of years. 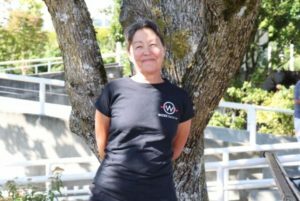 She has travelled widely, mostly to warmer climes where she was a sailing instructor, a DiveMaster and she has delivered yachts to and from all points between Mexico and Northern BC. Cathy enjoys being on, in or under the water, horses, long walks, gardening and cooking and is an avid reader. But best of all, she enjoys spending time with the boys; Adam, Cody and Tyler!